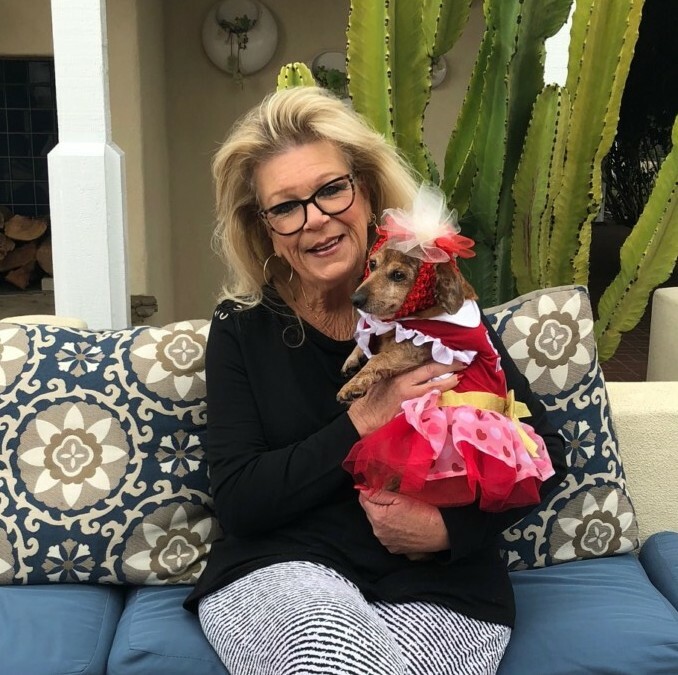 RANCHO SANTA FE — When Sharon Howland rushed her dachshund Lulu to the emergency veterinary hospital she knew something was wrong, but she never imagined it was as serious as it was. Her local veterinarian at the time was treating her dog for lower back issues. However, at California Veterinary Specialists in Carlsbad, which offers emergency surgical treatment and care, Howland heard a completely different diagnosis. It all happened on Mother’s Day in 2010 when 3-year-old Lulu began screaming in pain. Howland was living in Vista at the time. Completely distraught, Howland didn’t know what to do. Her husband at the time was out of work and they were on a tight budget. And Howland said she had already spent a great deal of money with her other vet treating what she thought was a back issue. “At the hospital, somebody at the front desk said, ‘Well, there’s a place called the FACE Foundation, and you can apply to have the surgery paid for’ they explained,” said Howland. The FACE Foundation pays for one-time, life-saving surgeries for pets whose owners can’t afford them. Howland got the paperwork filled out. Within two hours, Lulu was in surgery. And her surgical outcome was excellent. Now at 14, Lulu is the official mascot of Bags & Baubles, an annual silent auction fundraiser for the FACE Foundation. In fact, she has been their mascot since the inception of Bags & Baubles, which started eight years ago. Landing on April 29 this year, the event is held at a private Rancho Santa Fe estate where supporters shop for new or gently used designer handbags, accessories and jewelry. Every purchase goes to help animals like Lulu who need a one-time, life-saving surgery. Howland said what she loves most about the Bags & Baubles are the animal lovers who attend. But most of all, supporting the FACE Foundation means providing pet parents with grants so that they can save their pets with surgery. Executive Director Danae Davis calls what Howland was facing in 2010 as having to make an economic euthanasia decision before she learned of the FACE Foundation. “Economic euthanasia leaves pet owners in a grieving state like Sharon, who said she couldn’t afford to save her family member, Lulu,” Davis said. Since opening its doors in 2008, FACE has aimed to end economic euthanasia. “We work with over 150 veterinary hospitals in San Diego,” she said, adding that last year they gave more than 300 grants. In 2018, they expect that number to reach 350. Davis said that the Bags & Baubles event is one of its largest fundraisers of the year. The anticipated inventory is 350 or more designer handbags, more than 60 jewelry pieces and 75 pairs of designer sunglasses. FACE expects about 400 attendees and nearly 100 volunteers on hand that day. In addition to shopping for a cause, there will be wine, gourmet appetizers, desserts and more. Davis said there is something for everybody at Bags & Baubles. She’s also thrilled to have Lulu as their mascot. To date, event sponsors include The Robb Family, Howard Finkelstein and Lorin LeGrant, Ranch & Coast Magazine, The Muha Family, The Spitcaufsky Family, California Veterinary Specialists, Missy and Phillip Cameron, Veterinary Specialty Hospital, Wendy and Willy Perry, Animal Protection and Rescue League, Cheryl Passer Design, Sky Facial Plastic Surgery, The Flash Collective, TLC The Lane Company Insurance Services, The Narrow Gate, The Ark, Lifetime Animal Care Center, La Jolla Veterinary Hospital, High Valley Veterinary Hospital, Performance K9 Training, KUSI News, Torrey Pines Bank, SaveThisLife.com, Deux Lux, Kings Pawn, Plaza Boulevard Pet Hospital, The Real Real, Kendra Scott and Carlsbad Golf Center. Tickets are $25 per person. To learn more about Bags & Baubles or to purchase tickets, visit Face4Pets.org or call (858) 450-3223.